Last weekend was spent in the cold. I was out of town (Lake Tahoe), but it was still cold. On Saturday, I wanted to get the scooter out and get it ready for me to start riding to work most days. And I did, ignoring the cold, bundling up in a coat, gloves and a helmet. Took it for a ride down the road for FREE AIR (most places charge at least a quarter now) and to help the battery charge level. I’m hoping in the next couple of weeks, I can get be a regular on the roads. A Visit From Dave – It’s not too often I get to meet fellow bloggers, but when given the opportunity, I always try to make it happen. 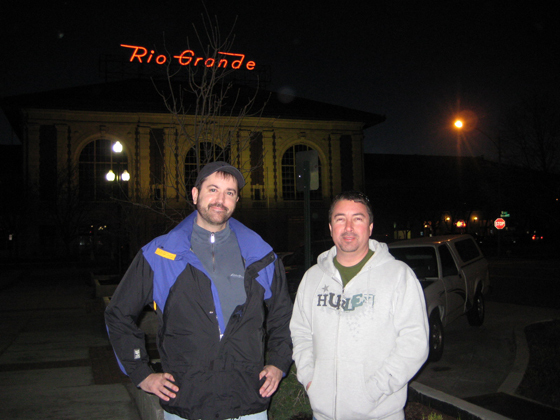 Dave from Blogography was in town and my fiance and I were able to meet up with him at Rio Grande Cafe (the old train station). Even in his pain-killer induced state, he was his humorous and witty self. And it gave both of us the chance to have a picture of ChillyWilly posted online. So as another weekend ends, it’s one more weekend closer to warmer days in Utah. Which I look forward to each and every day. Glad you had a great time :). *blush* thanks, Hilly. Didn’t realize how tall Dave is.